The support of creditor elements who felt that a strong central government would give protection to public and private credit. A month after the constitutional convention adjourned, James Madison, the acknowledged leader of the advocates for a strong central government, wrote to Jefferson, then in Paris, sending a copy of the proposed constitution along with his comments. His comments described the positions that the Federalists would take up in the debate over ratification. I cannot say, Mr. President, what were the reasons of every member of that convention for not adding a bill of rights. I believe the truth is, that such an idea never entered the mind of many of them. I do not recollect to have heard the subject mentioned till within about three days of the time of our rising; and even then, there was no direct motion offered for any thing of the kind. I may be mistaken in this; but as far as my memory serves me, I believe it was the case. A proposition to adopt a measure that would have supposed that we were throwing into the general government every power not expressly reserved by the people, would have been spurned at, in that house, with the greatest indignation. Even in a single government, if the powers of the people rest on the same establishment as is expressed in this Constitution, a bill of rights is by no means a necessary measure. In a government possessed of enumerated powers, such a measure would be not only unnecessary, but preposterous and dangerous. Federalists felt strongly that the inability of the United States, operating under the Articles of Confederation, to implement protective tariffs had led to the uncontrolled flood of manufactured items that were depressing the new nation's economy. They pointed out that the European powers were not likely to negotiate thirteen separate commercial treaties, and that Britain was well served by letting the situation fester. 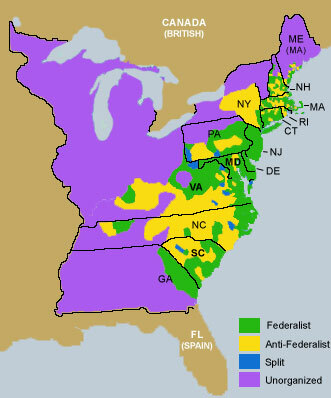 The term "Federalist" was later applied to the emerging political faction headed by Alexander Hamilton in George Washington's administration. I had rather be a free citizen of the small republic of Massachusetts than an oppressed subject of the great American empire. Perilous Fight: America's Intrepid War with Britain on the High Seas, 1812-1815 by Stephen Budiansky.